I always thought there were two variations of the classic British road trike: the first based on a “ground-up” tricycle frame and the second–the heavier of the two options–based on a bicycle frame with a bolt-on rear end. A trike designed as a three-wheeler from the start has at least three advantages over a bicycle conversion: it’s lighter because it has two seat stays instead of four (the bicycle’s stays plus the conversion’s stays), it’s stiffer because all the tubes are brazed or welded, and it has fewer parts because you don’t have any nuts and bolts to hold the various tubes together. Well, it turns out there’s a third variation, and this one comes from Tempo Tricycles in Australia: it has a bolt-on rear end, but the thing the rear end is bolted to is not a bicycle. The front frame features a diagonal “midstay” that’s attached to the top tube ahead of the seat cluster, bisects the seat tube and terminates at the end of the monotube chainstay. That termination is bolted to the cage that links the two halves of the rear axle housing. The rear axle assembly is also bolted to the seat stays, which in turn are bolted to the seat tube below the seat cluster. 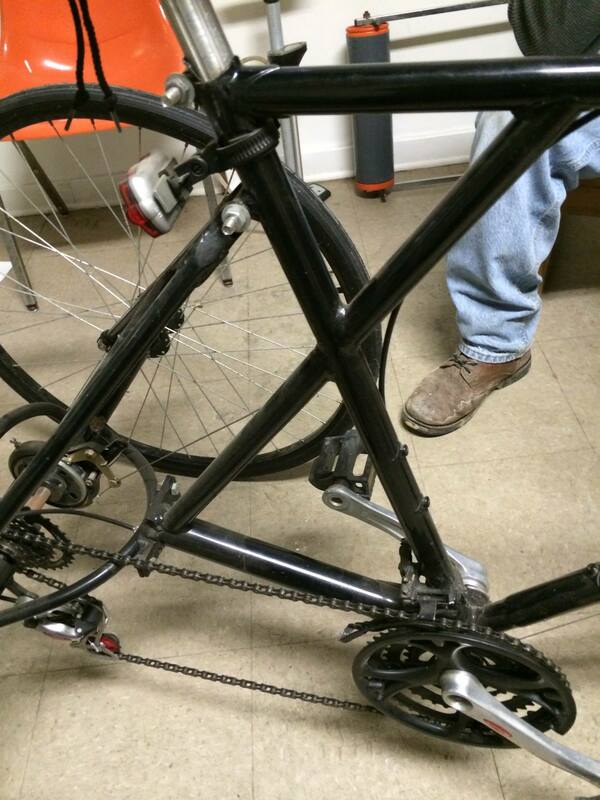 If you take the rear end off a bicycle-based conversion, you can turn the front end back into a bicycle, but if you unbolt the rear end of the Tempo, the front end is useless. The only reasons I can think to build a tricycle this way: 1) It’s cheaper to ship the trike knocked down, or 2) you want the option to swap out the rear end, maybe for a cargo platform on an extended wheelbase. However, you’d also need longer seat stays–seat stays that would cut into the cargo space–to reach the more distant rear axle. 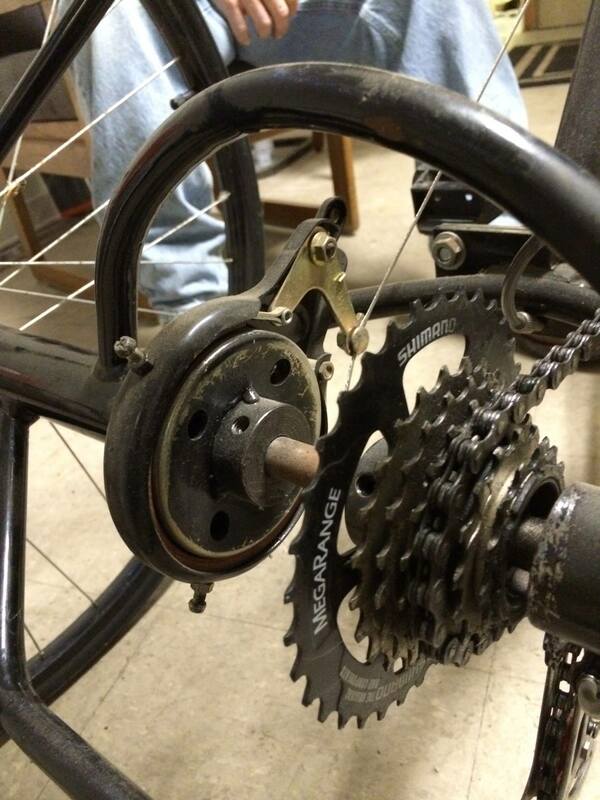 And a longer chain, brake and derailleur cable. Plus the second rear end and enough leisure to perform the swap. 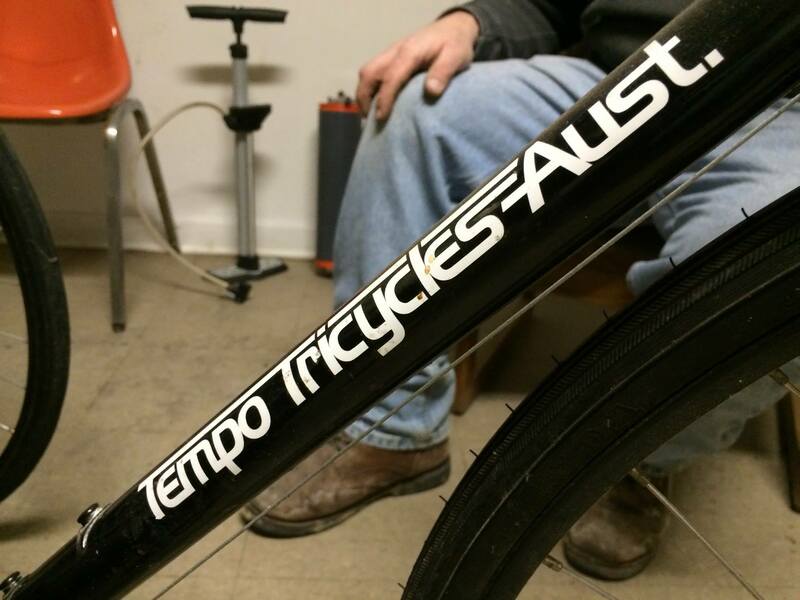 The Tempo has some curiosities beyond the midstay design. It has a rim brake on the front wheel and an inboard band brake on the rear axle. However, the band brake only works on the left wheel. 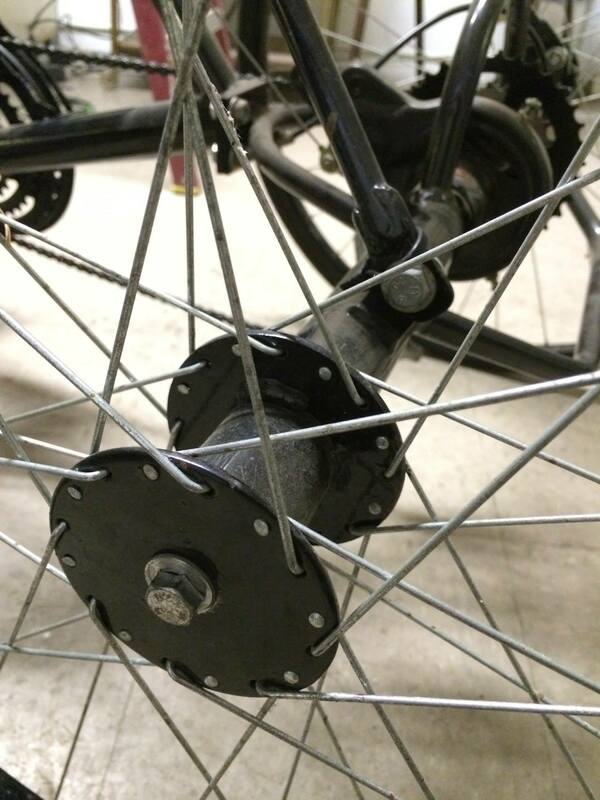 While many tricycles have two brakes on the front wheel and none on the rear–an arrangement that works perfectly well on my Paisley trike–it seems strange to have a rear brake system that only affects one side of the machine. I didn’t take the Tempo for a ride, so I have no insight into the design’s effectiveness. What else to add? The downtube is oversize in the middle and, to fit into the lugs of the frame, normal diameter at either end. That’s a bit odd, though I’ve seen something similar on older U-frame folding bicycles. The rider applies power to the left rear wheel only. Nothing unusual in that–left-wheel drive apparently works pretty well on British roads, though it leaves something to be desired when climbing a hill on the right-hand side of a cambered road here in the States, something I’m familiar with because I drive the left wheel of my Paisley through a thoroughly British Higgins axle. The Tempo is old enough that it’s hard to identify the original parts, but it’s difficult to believe it came with a Tektro brake lever and Suntour shifter on the left side of the handlebars and a Shimano STI lever on the right. It’s running an entry-level Shimano triple crank with a MegaRange freewheel in the back; it has aluminum rims; and it has three sets of water bottle braze-ons. 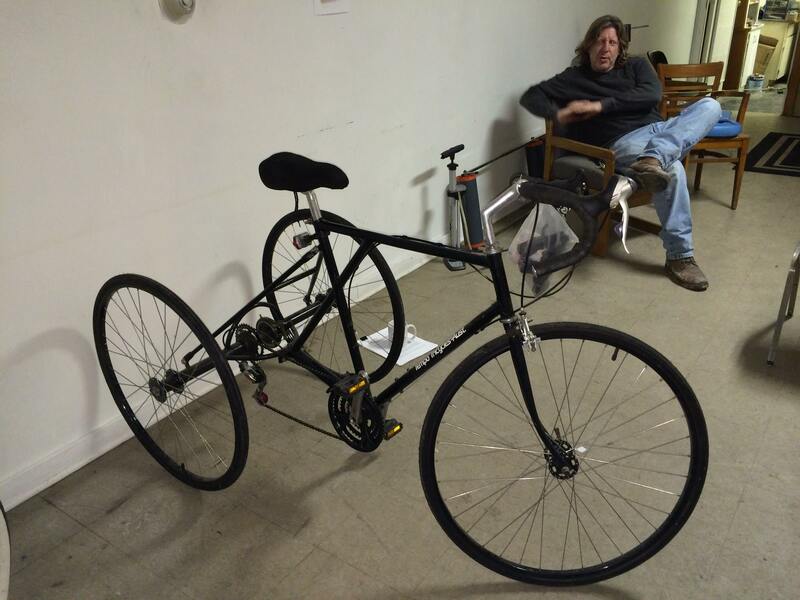 It’s not the lightest tricycle on the planet, but it may be the only one of its kind that I’ll ever see. Thanks for the tour, caretaker Tim Beeney. This tricycle is a bit odd even for Tempo Tricycles. The majority of its output seems to be tricycles for riders with special needs, and no, that doesn’t include the rider of the Piano Cycle. This entry was posted in Other bicycles and tagged Australia, British, Tempo Tricycles, tricycle, trike. Bookmark the permalink.